How to Watch a Race – Hello Race Fans! After some practice you will find yourself using your race-watching skills automatically, making astute observations that others will miss. Believe me, no other racetrack skill will ever be more useful. Much of his instructive passage is geared towards an on-the-track experience and using binoculars, but there are pointers that can be used to your advantage in any situation. This will help you identify horses on the move, either forwards or backwards! This technique helped me see that Mine That Bird was making a monster move coming out of the backstretch while others, including the announcer(! ), didn’t see him until he was sneaking by the rest of the pack on the rail. Noticing when a horse makes their move can also tell you a lot about their running style and under what conditions they’re likely to run their best moving forward. 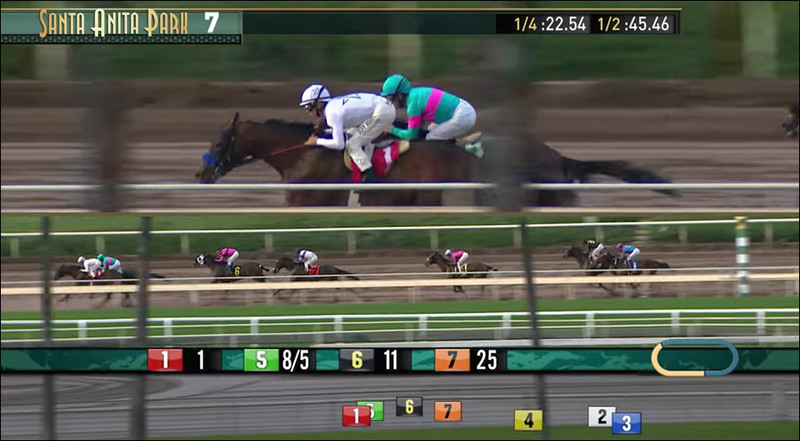 Obviously this is a natural tendency when watching a race in real time, but you don’t want to end up having to ask yourself “What happened?” if several other horses pass yours right before the wire when you thought your horse had it all wrapped up. Another tendency, particularly when watching on TV or a computer, is to watch the front of the pack. Many tracks broadcast their races with a split screen providing a close-up shot of the front of the pack and wider shot of the entire pack. While it can certainly be spellbinding to watch a couple of front runners duke it out, keeping your eyes moving around the entire pack will help you catch anyone making a move. Another common scenario is that all eyes are on the big favorite for a race, and if that horse fails to make it happen, you’ll miss the real action. For example, in the 2008 Belmont Stakes, everyone (myself included) was so busy watching Big Brown going in to the turn that we all missed Da’ Tara wiring the field. By getting caught up in the hype, you’ll miss the real story. Davidowitz points out that on the turn into the stretch is the place “the majority of races are won or lost”, for a variety of factors. He specifically speaks at length about what you can learn from watching the decisions a jockey makes about how and where to position the horse. Some tracks have a longer stretch than others. For instance Fair Grounds in New Orleans has one of the longest stretches, so a horse that seems in trouble coming into the stretch there might be able to recover by the wire. Oaklawn in Hot Springs Arkansas on the other hand has a very short stretch, so in the same scenario a horse might run out of room. Most tracks use standard set of colors for saddle cloth numbers, #1=red, #2=white. Some tracks, such as Keeneland, use a uniform color for branding purposes on big race days. What’s helpful about the saddle cloth colors is that sometimes the only differentiating thing you can see in a pack of fast moving horses is a glimpse of the saddle cloth (and not even the number!). In these cases knowing that blue is #3 or yellow is #4 can really help you to figure out who’s who. You should also note that the saddle cloth colors are different for harness racing. Like catching a peak at the saddle cloth color, sometimes the only thing you can really make out in a pack of horses is the helmet color. Of course this doesn’t help if they all have white helmets! Another place you can look to determine who’s who is the upper arms of the jockeys as they wear arm bands that display their number. Practice makes perfect. Don’t be hard on yourself if you don’t catch things during the race, it’s not easy! You can always go back and watch replays. And if you find yourself confused about what the announcer is saying, be sure to check out “Understanding Race Calls” for a list of commonly used phrases used during races! I never realized that there was a way to do this! Joan the Magnificent predicts that Hello Race Fans is going to be known as ground zero for a generation of future wise guy bettors!! Let’s hope so, Joan the Magnificent! Thanks Steve, glad you’re enjoying the site! years ago, the saddle cloth color for #7 was purple. somewhere along the line, that got changed to orange. can someone tell me when and why the change? Hi Don, we’ll try to track this down for you. Thanks for stopping by! Do you guys know anything about RTN, the Racetrack Television Network? I’m thinking of trying it out? Hi Ryan – No, we’ve never tried it. Be sure to let us know how you like it if you give it a try, and thanks for stopping by! Please answer, I need advice. How can I make the most out of watching horse races at home on my computer? Hi Ryan – what are you currently using to watch races, or are you also looking for advice on the best viewing sources? I’m using live video streaming from a wagering platform, and no I’m not asking for the best viewing sources. Got it! Well, I think all the same principles outlined above apply but watching from your wagering platform on your computer can present additional challenges, especially on big race days when the connections can get overloaded causing buffering, pauses and skipping, usually at the most critical and exciting moments! One thing that can be helpful is maximizing the size of the player. This really depends on whether your ADW allows it and what kind of options are available (e.g., dragging to the desired size or if it’s only full screen). This can also be a drawback if you have a large screen with a high resolution and your only option is full screen because it won’t really make it easier to see anything + it could cause more sputtering (another variable would be your connection speed). Thanks for stopping by, and I hope this helped! Let me know if you had other questions or if this was in the ballpark of what you were asking. Actually, buffering is not a problem for me. My live video streaming rarely buffers because I have a good internet connection. The question I’m asking is that I want to make watching and playing the races on my computer more enjoyable. When I’m planning on watching a race card from a track, I usually buy Daily Racing Form past performances so I can handicap the races. And I get entries and race program info from Equibase. I’m just asking your advice on what can I do to make this experience better. Please respond. While having some camaraderie with fellow players via Twitter will never replace hanging out with people at the track, it can definitely enhance the “playing from home” experience. I hope this answer was more helpful! Thanks, Dana. This was helpful. Glad to hear it, thanks for stopping by Ryan! ©2008 - 2019 Hello Race Fans, Inc., except where copyright is retained by original owner/producer. All rights reserved.